"James Ramey" aka "Baby Huey", was the singer of the band "Baby Huey & The Babysitters",who released several 45 rpm singles during the 60's. In 1969, curtis mayfield signed "Baby Huey" without his "The Babysitters" on the Curtis's label and produced this record with the help of donny hathaway like arranger. Baby Huey died of a heart attack on October 28, 1970 and the record released after his death in 1970. You could appreciate his great rocky voice on different songs like "Hard Times". 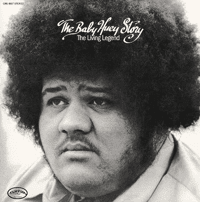 Baby Huey recorded amazing versions of Curtis's songs like "Mighty Mighty", "Hard Times", ..., sam cooke's "A Change Is Going to Come" and "the Mamas and Papas"'s "California Dreamin".